3 available shipping rules Shippo, Flat Rate, and Free Shipping Providers, Shippo is the leading multi-carrier shipping API and dashboard that empowers platforms, marketplaces, warehouses and e-commerce stores with the building blocks they need to succeed. The company processes millions of shipments per month for more than 10,000 customers. With instant access to multiple shipping carriers for real-time rates, printing. Easy method for customizing new shipping providers. You can define multiple roles for the same providers and specify the priority of rule applying. 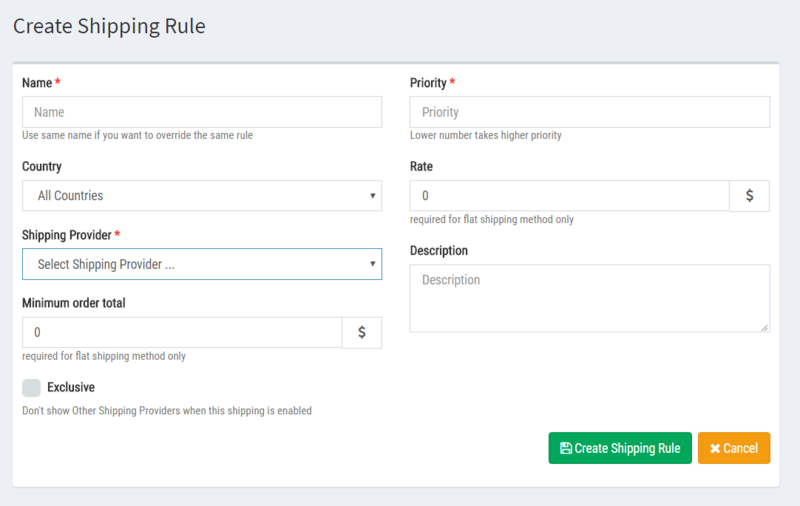 you can specify exclusive feature where if this shipping rule applied and has shipping method then exclude all other rules. you can specify minimum order total to allow this shipping rule to be applied. Tips & Tricks in Defining Shipping rules. if you provide Free shipping set it with priority “0” and make it exclusive. if you have multiple flat rules, for example, you can create multiple rules with different names. if you require rules overriding, make sure to set to low priority number for the higher priority and rule name should be identical.